I can finally reveal something I’ve been working on for the past year. This is my newest book, releasing with Martingale Press. (!!!!!!) 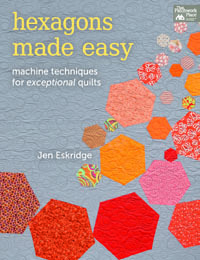 It is full of tips and techniques to make truly hexcellent projects. 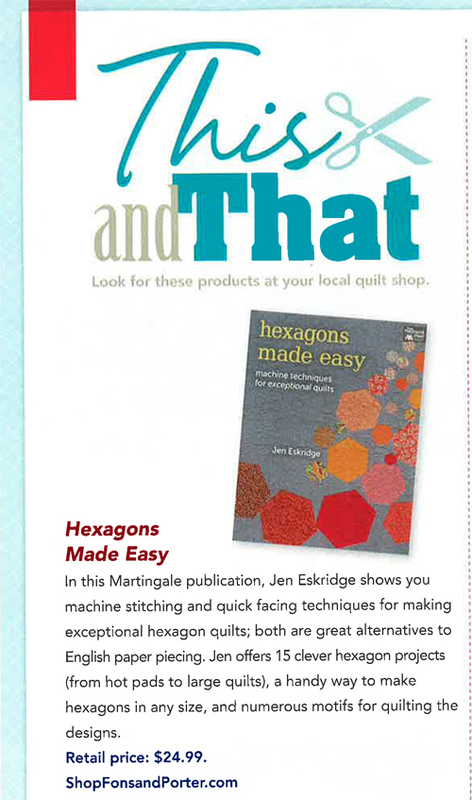 From Martingale: Create stunning hexagon quilts and so much more–without Y-seams or hand sewing. Sound impossible? 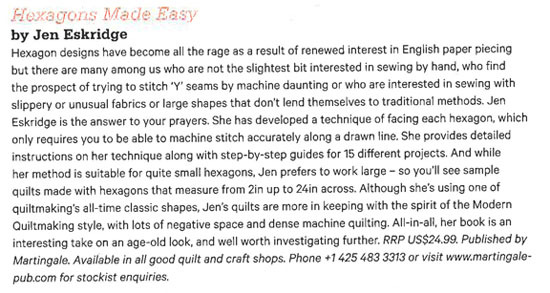 Expert quilter Jen Eskridge makes it easy with a quick facing technique, a great alternative to English paper piecing. Learn to use hexagons two ways: appliqu?d onto a background or stitched together without a background for a two-sided quilt. WANT THE BOOK AND A QUILT KIT FOR THE WALL HANGING ON PAGE 42??? In the next few weeks, I’ll show you more projects from the book and tell you how they came into being. It was a huge joy to work on such a straight-forward technique based book to yield such interesting contemporary results. See a more in-depth review of the book by following this link to Jen’s blog post coverage of title. Shops- This book is also available at United Notions. All books ordered directly from ReannaLily Designs will be signed by Jen Eskridge. Thanks so much for your support! Shipping is $2.95 for standard USPS mail. International orders will be contacted via email for shipping adjustments.